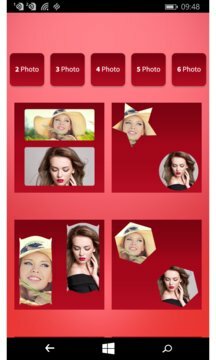 Create stunning looking collages made in free from collage or shapes collage or even mirror style collages with photo effects applied to photos with unique Borders and photo backgrounds. You can also write text on collages. Two Finger Gestures to move photos around, Resize Photos, Rotate Photos. Apply multiple overlay effects as well as vintage, sketch and more effects. After you are done editing the photos you can store images to your phone or share that image to multiple social networking sites. With Free form/flow collage you can easily select any number of images and drag on any corner. You can apply effects to any of the image, even control the blur intensity or even change the background, write text and more. Shapes collage are available for 2, 3, 4, 5, and 6 photo shapes. Choose from the custom shapes available, apply stickers, background and even write text to last your memories forever. 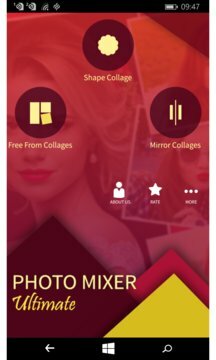 Mirror Shapes Collage is even more interesting with just one tap to change multiple patterns of the mirror. Apply effects to your images, write text, apply funny stickers and even crop the image as well. The text on photos is saved with collages. Create unique photo mirror effects. Create awesome looking collages with Photo Mixer. Any feedback is welcome and appreciated.